In 1975, Chilean director Alejandro Jodorowsky, whose films EL TOPO and THE HOLY MOUNTAIN launched and ultimately defined the midnight movie phenomenon, began work on his most ambitious project yet. Starring his own 12 year old son Brontis alongside Orson Welles, Mick Jagger, David Carradine and Salvador Dali, featuring music by Pink Floyd and art by some of the most provocative talents of the era, including French comic-book artist Jean “Moebius” Giraud, Hollywood screenwriter and special effects expert Dan O’Bannon, and future Alien designer H.R. Giger. 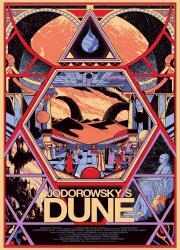 , Jodorowsky’s adaptation of Frank Herbert’s classic sci-fi novel DUNE was poised to change cinema forever.